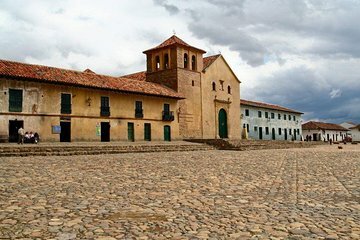 Visita la Villa de Leyva in Colombia con questa gita di un giorno di 11 ore con partenza da Bogotá. Scopri l'affascinante storia di questo villaggio magnificamente preservato mentre esplori la sua ricchezza di attrazioni, tra cui El Infiernito (Litte Hell), Boyacá Bridge, gli stagni blu e la vicina città di Raquirá, un hotspot per souvenir fatti a mano. La tua gita di un giorno include il trasporto di andata e ritorno dal tuo hotel a Bogotà, con una guida e tutti i biglietti d'ingresso. Osserva da vicino la storia coloniale della Colombia e le affascinanti città appena fuori Bogotá in questo viaggio di 11 ore a Villa de Leyva. L'eccezionale architettura, i bei negozi e la ricchezza di attrazioni storiche di questa tranquilla zona offrono una panoramica perfetta della grande regione di Bogotá. Inizia la giornata con un pick-up alle 7:00 dal tuo hotel Bogotá, procedendo verso nord in direzione di Villa de Leyva. Durante il tragitto, fermati al Ponte Boyacá, sito della famosa Battaglia di Boyacá, che ha contribuito a garantire l'indipendenza colombiana dagli spagnoli. Presto arriverete a Villa de Leyva. Prenditi il ​​tuo tempo per indagare sull'architettura sorprendente dell'area e ascolta mentre la tua guida condivide una panoramica della storia del comune. Ti fermerai per controllare la piazza principale della città, la Plaza de Mayor, e poi avrai l'opportunità di visitare i negozi e i ristoranti locali della zona. Sosta a El Infiernito (Little Hell), dove potrai ammirare un antico osservatorio di Muisca. Scopri come hanno calcolato il tempo ottimale per la raccolta e poi visita il bacino idrico creato dai contadini chiamato lo stagno blu, pieno di vivida acqua cerulea. Continuare con un autentico pranzo colombiano e (a proprie spese). Termina la giornata a Raquirá, dove avrai l'opportunità di visitare una vasta gamma di negozi di artigianato che offrono di tutto, dalla ceramica alle sculture in legno, gioielli e cesti, per raccogliere il ricordo perfetto della tua giornata. Quindi torna al tuo trasporto per il viaggio di ritorno al tuo hotel Bogotá. My husband and I took the Villa de Leyva trip on a Wednesday in April. We were told it could be cold and rainy, but the weather was perfect, sunny and 70 or so. The tour was indeed customized for us. We were picked up promptly at 7am the traffic leaving Bogota was horrible that time of day and we were later told its because of so many students going that direction to the universities at that time. Our first stop was to sample the local specialty of arepa made with corn flour and local cheese very delicious. Next we went to the village of Chiquinquirá to visit a cathedral renown for a miracle concerning an image of the Virgin Mary. We then drove on to Raquira to do a little souvenir shopping and to have a traditional lunch at a restaurant on the main square. The town is very picturesque and has many shops that sell pottery made of the local red clay. After lunch we stopped at El Infiernito Little Hell, a title given to the area by the Spanish colonists due to a number of phallic pillars at the site. It was a religious worship site for the indigenous people. It is now an archeological dig site belonging to a university. The site served the indigenous as a burial ground and observatory, helping them to create a calendar. We arrived in Villa de Leyva about 2:00 and walked around the village, taking note of the fossils which the Spanish colonists incorporated into their buildings and pavements as decoration. We also stopped for a hot chocolate at the Museum of Chocolate an unexpected, but delicious, experience. Our guide was very knowledgeable and explained the background of all the sites on the tour as well as information on the lifestyle of the farm people. The farmers have their own cultural practices, music and way of dressing. It was a very full day and we felt that we were able to see a much more diverse side of Colombia by going on this tour. This is a great trip and a way to visit an area that few people who visit Bogota get to see as it is a long one. It took 3 1/2 hours of driving through very interesting countryside to get to our first stop which was Todo Raquira, a very picturesque old Colonial town. Then to the pre-Columbian astronomical Muisca Observatory and next to Villa de Leyva, a very well-preserved Spanish colonial town. A great lunch was had in Villa de Leyva. My tour guide was very knowledgeable and a great companion. This wasn't a private tour, but I was the only one on it. We had torrential rain going back to Bogota, which was handled expertly by our driver. This is a beautiful town and the landscapes you watch while getting there are breathtaking. I gave it 4 stars because the driver was like a "maniac on wheels". At some point when I saw him passing 4 cars in a curved two lanes highway I started to think "That's it". I am glad we came back alive. Villa de Leyva is definitely an enchanting village with an amazingly big plaza, it is worth seeing. However my tour guide, even if a very nice young man, was not prepared at all. He barely said few words about this place and if you pay for a private tour as I did you surely except much more information. Fue una experiencia muy grata y emocionante, Julio César, el guía, sabe mucho de la historia colonial y reciente de la región, fue impresionante saber que en lo que ahora son los andes antes era mar, ver el fósil en Villa de Leyva fue impresionante. Recomiendo este viaje pero si tienen la oportunidad de tomar el recorrido de 3 días no lo duden. We cannot rate this your highly. Although our guide (Haiti) spoke English, she did not have a strong command of the language. It was very difficult to understand many of her words. She often didn't understand what we were asking (with repeated attempts, rephrased differently). See e-mail sent.